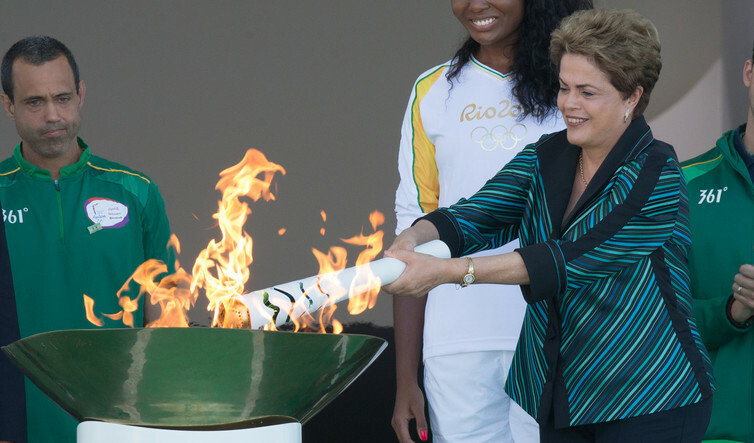 When Dilma Rousseff received the Olympic Flame in Brasilia at the beginning of May, her intention was to attend the opening ceremony of the Rio 2016 Olympic and Paralympic Games as Brazil’s head of state. Now, the nation’s first democratically elected woman president has been suspended pending an investigation into allegations that she intentionally concealed the size of the country’s budget deficit. This is only the second time that an impeachment has been sought against a Brazilian president, and its legality has been contested by representatives from Rousseff’s government. The topic has divided the country, and millions of citizens have taken to the streets – either to call for Rousseff’s resignation, or to rally against her impeachment. In some cases, violence has reportedly broken out between civilians and the police, and it seems likely that more protests will follow. Meanwhile, the nation continues to struggle with its deepest recession since the 1930s – not to mention outbreaks of mosquito-borne diseases such as Zika Virus, dengue fever and Chikungunya and the ongoing Petrobras corruption scandal. With fewer than 100 days to go until the opening of the games, some are starting to question whether Brazil is still in a position to host the sporting mega-event. 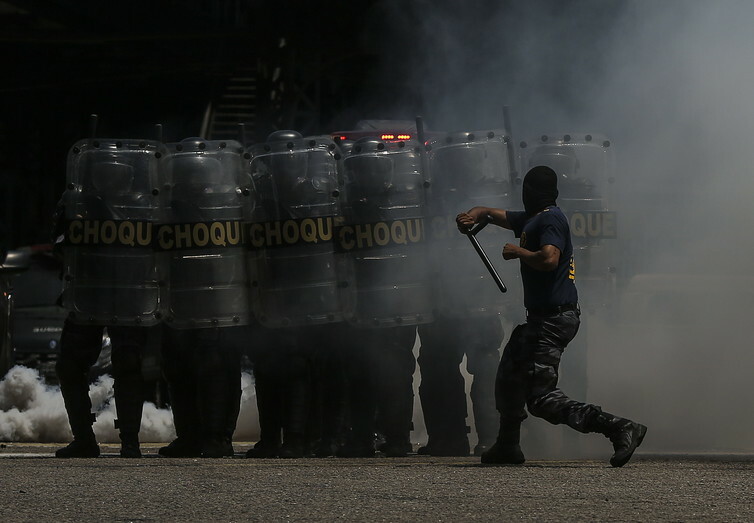 This isn’t the first time that Brazil has experienced civil unrest while standing in the international spotlight. In 2013, protests against the rising cost of bus fares were met by police close to Maracanã Stadium, where the Confederations Cup was taking place. But on the whole, well-organised security operations have usually ensured that such events have gone ahead without a hitch: neither the 2011 World Military Games, nor the 2014 FIFA World Cup, experienced any major incidents. This may sound excessive, but in reality authorities will be cautious about using force against protesters. The new government will want to reassure citizens – for whom the memory of Brazil’s former military dictatorship looms large – that the country is still a democracy, and that every military intervention will be made with proper oversight. As well as the social and political unrest, the new government will also need to address Brazil’s economic collapse. The games have exposed the fault lines between rich and poor in Brazilian society. For less wealthy citizens, the impacts of the nation’s worst economic crisis since the 1930s have overshadowed the dazzle of the Olympics. 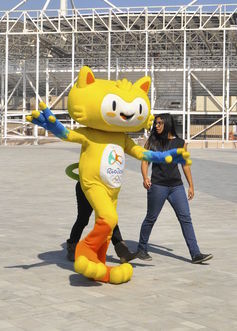 Tickets and merchandise for the games are only really affordable for foreign visitors and the Brazilian upper classes: ordinary Londoners were likewise excluded from the 2012 games. What’s more, most Brazilians do not expect the games to afford them any significant economic legacies. Indeed, the high cost of hosting the games is enough to put many cities off. For instance, Montreal struggled to pay off its 1976 Olympic bill for 30 years after the event, while costly infrastructure from previous games in Athens (2004) and Beijing (2008) has since been abandoned. And Brazil has had bad experiences in the past: the 2007 Pan-American Games, held in Rio, left little aside from abandoned infrastructure and unfulfilled promises. Many of these public spaces were later privatised, to reduce the cost of maintaining them. Yet the government has sought to reassure citizens of Rio that Olympic investment will contribute to the public good, by opening spaces such as Madureira Park; a 90,000m² site in one of the city’s less affluent neighbourhoods, which has become a hub for families and friends who meet there to dance, play sport or simply enjoy the park. The interim government is also arranging its affairs to ensure the smooth running of the games. As well as appointing a new cabinet, interim president Michel Temer has introduced Leonardo Picciani as the new minister for sport (which makes him the third person hold the role in 2016) – despite a reported conflict of interest. But former minister for sport Ricardo Leyser – who has been with the ministry since 2003 – is likely to remain on the scene, to support the Rio 2016 Organising Committee, ensure continuity and help to maintain connections between the government, the organising committee and the International Olympic and Paralympic committees. We know that Brazil has the capacity to host successful mega-events: it’s been doing so since the beginning of the 20th century. Hosting the Olympic and Paralympic Games will be the nation’s biggest responsibility yet, but there are strategies in place to ensure that everything proceeds without incident. Yet there are no such guarantees when it comes to restoring peace, growing the economy, addressing public health crises and fighting inequality. There’s a popular proverb among the locals of Rio de Janeiro: “Everything will be okay in the end. If it’s not okay, it’s not the end.” And while everything might be okay for the Olympics, it is certainly not the end of Brazil’s political and economic struggles.